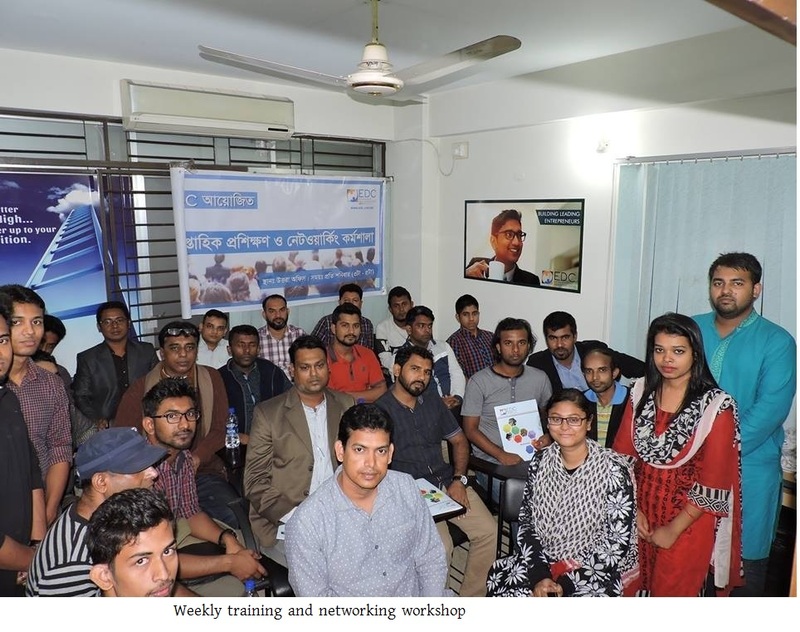 Entrepreneur Development Centre (EDC) is a social enterprise with the mission of solving unemployment problem of Bangladesh by giving training, mentoring and creating marketing platform through both online and offline media, seminar and educational activities at FREE of COST since 2014. 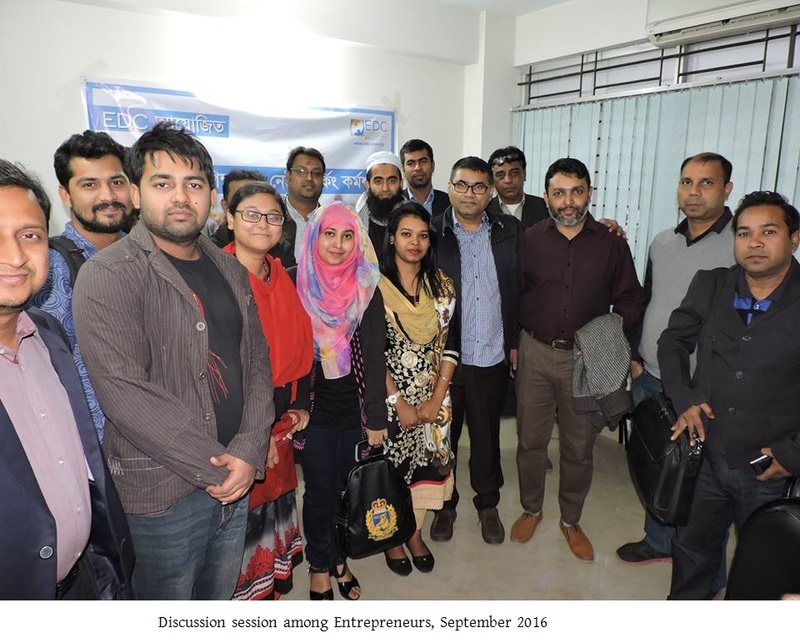 It has now become one of the popular entrepreneur hubs and trusted guide for the young talents of Bangladesh. Bangladesh has just entered into the era of MIC (middle income country) and struggling to meet the SDG set by UN. Still today, 4.4 million youths to face unemployed problem and without development of sustainable entrepreneurship, there is a risk to back in LDC (least development country). EDC sprouts certain programs to support prospecting entrepreneurs and startups. We hunt them sharply, hear them broadly, categorize them precisely, hold them firmly, mentor them specifically, finance (up to 1 million BDT) them partly or recommend them strongly to get fund intuitionally, train them necessarily, connect them with buyers and suppliers easily, encourage them to create self-domain uniquely, hand them to walk solely, observe them separately and award them for running successfully. Of ongoing programs, daylong workshop on specific topic sprouts beyond expectations. We arrange it twice in a month, not only absolutely free of cost of participants but also we provide free lunch and snacks. Young entrepreneurs overwhelm the sessions. Expert speakers carryout the workshops. Lots of participants are always in queue by registering their names. ‘Smart hawker’ is an unparalleled and unique initiatives introduced by our Chairman Salah Mazed. It has already created vibration in urban slum area in northern Dhaka City. Even being a capital of Bangladesh, it cannot resist thyself from poring by new comers from other parts of country, eventually some migrants become vagabonds. Saleh Mazed finds a solution to rail some of them into a career train which protect them from being beggar or snatcher. Initially as a test case, he had picked a number of 23 jobless individuals consist of men and women from the slum near airport rail way station of Dhaka. They were given stipulated amount (BDT 8000-12000 only) in terms of their capabilities and prospects to implement the ideas that matched with the activities of hawker or costermonger. Most of them had started some street vending like small tea stall, mobile shop of popular afternoon/evening foods (singara, chotpoti, chicken fry etc. ), selling low cost garments items or belongings on footpath, peddler of twist foods (chanachur, peanut, cigarates etc. ), but two women had chosen the task of cooking and supplying lunch boxes to the offices at Uttara, Dhaka. It just spurted and begun a new story of success since that two ladies hawkers are now established entrepreneurs and at least 24 workers to serve under them. As of today, at least 198 smart hawkers around Dhaka city are the significant portion of Dhaka’s informal economy, an employment opportunity for better livelihoods of the urban poor. Another amazing program of EDC is “Entrepreneurs’ Products Fair” where small scale manufacturers from all part of Bangladesh, by phases, get the opportunity to display and sell their products directly to the buyers and connecting with exporters. At times we arrange it in house or in specific yard. Like other services this also free of cost from participants’ end and we do as much advertise as they ask for. Moreover, we have created a platform in social media where entrepreneurs communicate each other and find solutions themselves. EDC-ADDA is a spontaneous physical gathering where established entrepreneurs do exchange their views with startups at our office premises twice in a month. We stipulate holidays for taking place these sessions. Young entrepreneurs appreciate highly this type initiative of EDC. Near future we are going to establish a Virtual University as we are unable to meet the increasing demand of related training for our enlisted 15000+ members through physical training system.Not only our members but also all upcoming entrepreneurs will get all distinguished training, related contents from virtual platform as well as certificates in terms of online exam without expending single penny. However EDC is promised to keep continuing indispensable and consequential programs for the sake of development and sustain of Bangladeshi Entrepreneurs.